We operate to key destinations within Paterson Inlet, including Ulva Island and along the north eastern shoreline of Stewart Island. Our key destinations are shown below. We can also drop-off / pick-up at other locations. We strongly advise you to pre-booked your water taxi transport, to allow us to include it in our schedules - especially during the busy season December to April. Last minute bookings on the day may be difficult to accommodate. 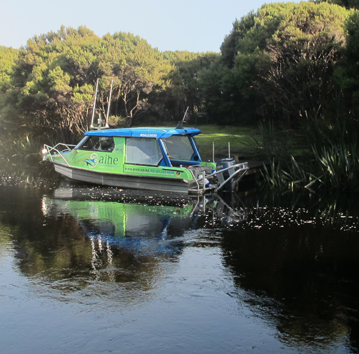 For Freshwater River, we are limited to transport 9 passengers on one tide per Department of Conservation permits. 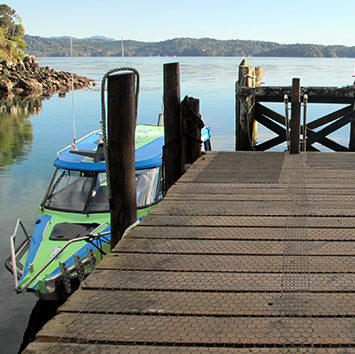 Our boat operates mainly from Golden Bay Wharf. Some trips may depart / return to Halfmoon Bay Wharf. We will advise you of the correct wharf at the time of booking. Shuttle transfers are available to and from Golden Bay Wharf or Halfmoon Bay Wharf should you require. Golden Bay Wharf is 10 - 15 minutes walk from the centre of Oban Village. Halfmoon Bay Wharf is in Oban Village. Rates for shuttle transfers are $6.00 p.p. 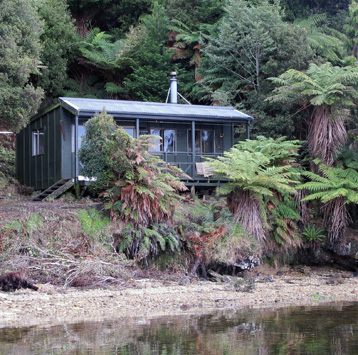 one way to and from accommodation or on arrival from the Stewart Island ferry terminal or flight depot. 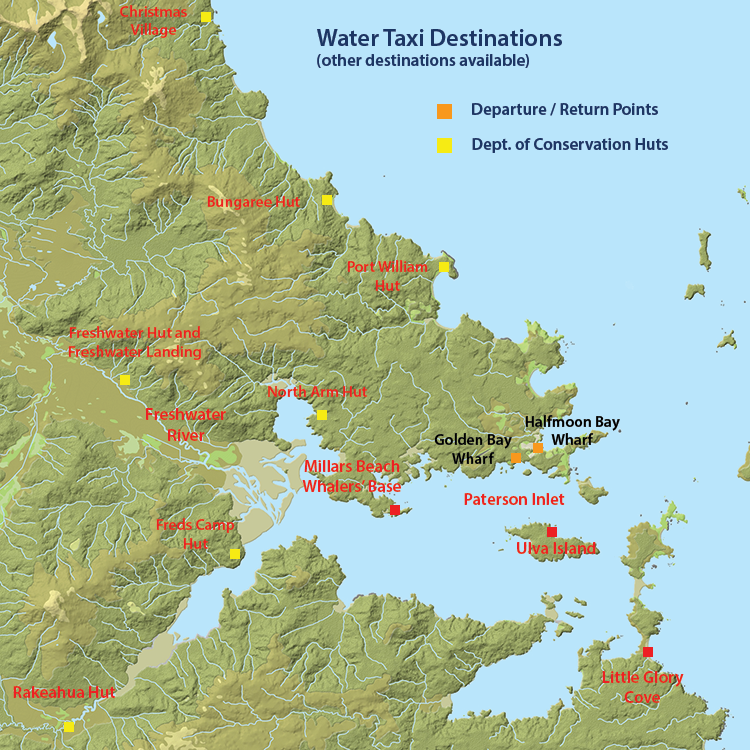 One of our Ulva Island options includes transfers to and from Golden Bay Wharf from selected venues (see below). The table below shows rates for independent travellers. Children below the age of 5 travel free of charge. Group rates are available on request. Group Rates are available depending on the trip and numbers. For hunter transport, see our page Hunter Transport. All trips operate subject to prior booking and suitable weather and sea conditions. Our water taxi operates from 7.45 am to 6.30 pm for standard destinations. After hours travel will incur extra charges. Please contact Aihe to discuss. For Freshwater River and Rakeahua River, we will operate from 7.30 am to 7.30 pm to fit in with tides and subject to daylight hours. After hours travel to fit in with tides and your travel plans may incur extra charges. Please contact Aihe to discuss. We donate $1.00 p.p. per trip into our Conservation Fund. We aim to travel a reasonable speed to allow you to view scenery and where appropriate wildlife along the way - in particular on our Ulva Island, Port William and Freshwater trips. ^Transfers are in our licensed road transport to Golden Bay Wharf and back, from Ruggedy Range™ Booking Office or select accommodation venues in centre of Oban. > From November to March adult cost of Freshwater River is $60.00 p.p..
* Trips are tide dependent and subject to daylight hours. HMB Rate applies from Halfmoon Bay Wharf. GBW Rates applies from Golden Bay Wharf.